Discussion in 'Seerat ar-Rasul' started by omar zeb, Dec 11, 2017. I had seen this a while back but I don't think it's plagiarisation. In the Amazon link, compare the chapter "Mission" to aH's. The writing styles are quite different. I find Turath's translation to be subpar. And in that chapter in particular, they state that commencement of prophethood began at age of 40. I found another translation of Nur al-Uyun published by Turath in 2016. I could be wrong, but it seems like a brazen attempt to take sidi abu Hasan's translation, change the words here and there and pass it off as their own. Turath is known to publish deobandi scholars works (besides publishing few classical texts). May be they ran out of the titles to print (from their stable of scholars) and plagiarised aH's work. With a translation, it will be difficult to pin the allegation of plagiarisation. I am sure they dropped the appendices. Ridawi Press doesn't print books. They are released as ebooks and anyone is free to publisht them into hard copies as long as the content isn't edited. This book is so Beautiful ما شاء الله- and i would like to ask permission to share excerpts from this in my Facebook groups ? Also -- where can i buy the hard-copy version of this book and others which are updated here? Do you ship to Asia and Arabia - what is the total cost for this book in particular inclusive of shipping / or air freight ? Ridawi Press doesn't print books. They are released as ebooks and anyone is free to publish them into hard copies as long as the content isn't edited. there was an error in qur'an text on page 87 [PDF-p98] as a word was missing. it is fixed now and the corrected edition uploaded. many thanks to the brother for informing us. may Allah ta'ala reward him. barakah - yes that must be it. Now that you mention it, I recall that the last time I felt something like this was when I was reading the risalah, "iqamat-ul-qiyamah" of sayyidi alahazart (alayhirraHmah). As you move from page to page - the text comes into view, smiling and sedate, gentle but strong, short but pithy, as if nothing in the world can unsettle it's forceful diction or bring it's authority into question. It suffers nothing but acceptance, willing or begrudged. the appendices are simply beautiful. they are short and sweet and have a freshness to them which puts me in mind of delicate rosebuds, dimpled with morning dew, gilded in a mellow sunshine. UPDATE: version 2.1 is now released. Download Here. the book is reformatted with professional fonts and looks better than the previous version. among other improvements, are corrections, rewording of ambiguous sentences, additional footnotes. many thanks to brothers who reviewed the book and contributed greatly in its improvement. for brothers who require a sans-cover edition (for them to be able to print), please contact me on my ridawipress.org email. Isaac Amini and Aqdas like this. I think the link to download the pdf is broken, can it be checked please. Just two recommendations that you should include the full takhreej of all the Ahaadith used in the text and the marginal notes. this was purposely omitted keeping in line with the objective of the book. 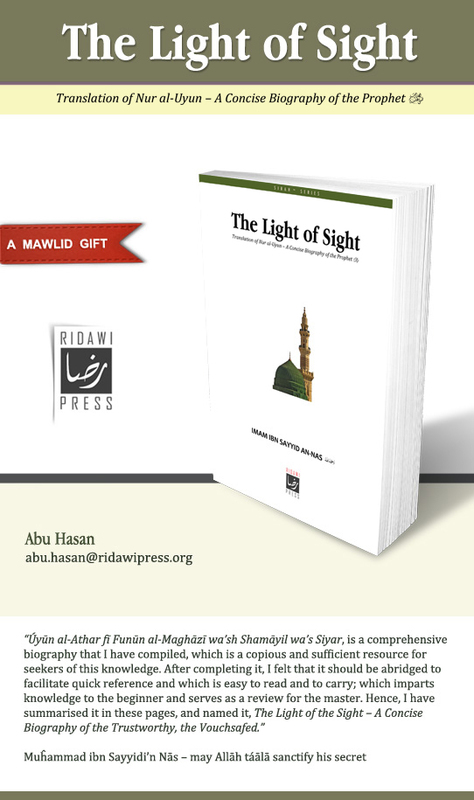 and as noted in the preface, in sha Allah we may released a referenced version in the future. in sha Allah wa bi tawfiqih. I was just browsing through the book Shaykh Abu Hasan has done a very good job translating it Ma sha Allah Tabaarak wa Ta'ala. Just two recommendations that you should include the full takhreej of all the Ahaadith used in the text and the marginal notes. This is a need of our times and should be a standard in all books. Also if you could inculde the Aaal in the salaat wa salaam after the blessed name of the Prophet Muhammad sall Allahu 'alaihi wa Aalihi wasallam in sha Allah Ta'ala. ma sha Allah, this is a very timely contribution. I am lost for words. It is a real surprise. And a extremely wise one. It is as if four moons have appeared! Think about it, how many concise, traditional English Level biographies of our Master SalAllahu alaihi wa alihi wa Sallam are in our bookstores?? brother Abu Hasan is engaging in this activity wholeheartedly, so that we spread these works and all Muslims and non-Muslims in the west benefit. We need to introduce our Habeeb SalAllahu alaihi wa alihi wa Sallam the most. jazakAllahu khayran, aH. this is excellent. so many things of importance are surely unknown to many muslims out there. this gives us the main facts concisely. and the appendices, they follow the pattern of the book. short and sharp. irrefutable proofs for every issue discussed. Allah yarham walidayk, abu Hasan. JazakAllahukhayran sidi abu Hasan for this beautiful gift.